The South Branch flows through the Smoke Hole region in Pendleton County. Photo courtesy Rick Burgess. The South Branch of the Potomac River rises in Highland County, Virginia, and flows northeastward across the eastern panhandle of West Virginia to its junction with the North Branch of the Potomac River near Green Spring, West Virginia, a distance of more than 200 miles. ts principle tributaries are its North Fork and South Fork, which join the branch near Petersburg and Moorefield respectively. The South Branch of the Potomac and its north and south forks drain all or parts of Pendleton County, eastern Grant County, western Hardy County, and western Hampshire County. The South Branch is the largest tributary of the Potomac River in West Virginia. Valley of the South Branch. Photo courtesy Yvonne Wilcox. The valley of the South Branch is known for its pastoral scenery. 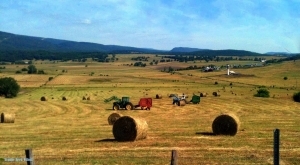 Its upper valley, near Moorefield, WV, opens into one of the largest areas of level land in West Virginia and is part of one of its most productive agricultural areas. Its skylines are dominated by the long parallel ridges of South Branch Mountain, to the east, and Patterson Creek Mountain, to the west, both of which rise to more than 2,000 feet above the floor of the valley. From source to mouth, the following select towns and villages are located on or near the South Branch of the Potomac River. The South Branch and its forks are popular destinations for fishing, swimming, and boating. 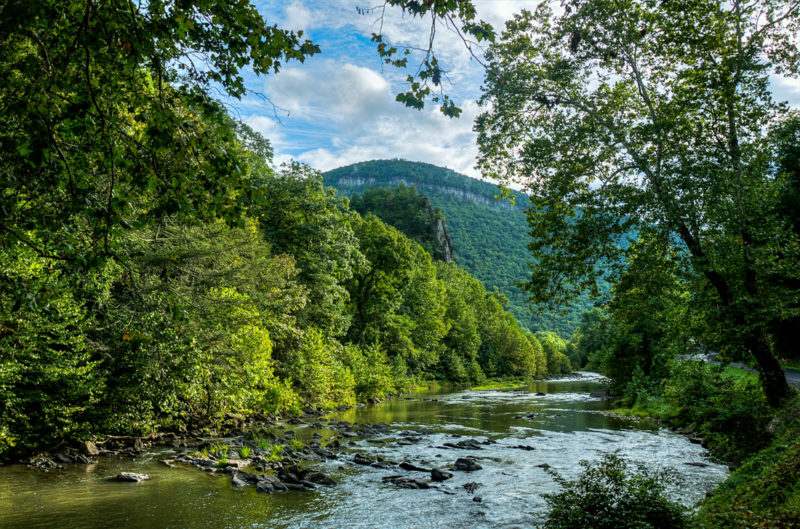 Much of the river and its tributaries course through parks and recreation areas, including the Monongahela National Forest, through which much of the upper South Branch and its north fork descend, and the Washington & Jefferson National Forests, along which the south fork flows. Other parks and recreation areas along the branches include the following. Information on lodging, dining, and recreation on and near the South Branch of the Potomac River may be found in our guide to travel in the Potomac Branches Region.